Shumenov (right) fell to 14-2 with his loss to Hopkins. The light-heavyweight title fight between Bernard Hopkins and Beibut Shumenov on April 19 was unique for a couple of reasons: First there was Hopkins, at 49 years old, attempting to become the oldest boxer in history to win a world championship. Also, Hopkins-Shumenov was one of the few high-profile boxing cards in recent memory in which both main eventers were Muslim. Those were two intriguing storylines going into the bout. Once the bell rung, however, the fight became unique for Shumenov as Hopkins took him to school, took his WBA championship with a 12-round unanimous decision, and handed Shumenov just his second loss as a professional. This Saturday, Shumenov (14-2, 9 KOs) returns to the ring for the first time since the Hopkins loss. The 31-year-old from Kazakhstan will face Bobby Thomas Jr. (14-2, 9 KOs) in a cruiserweight match in Las Vegas that will air on Showtime. Shumenov-Thomas will be on the undercard of the main event involving welterweight contenders Amir Khan, a practicing Muslim of Pakistani-British descent, and Devon Alexander. For his first foray into the cruiserweight division, and looking to regain champion status after the Hopkins loss — the NABA U.S. title will be on the line — Shumenov has hired a championship-level trainer in Ismael Salas. The highly respected Cuban trainer has worked with current and former world champs like Guillermo Rigondeaux, Yuriokis Gamboa and Jesse Vargas. The hire is especially notable considering that Shumenov has essentially been self-trained for the last two years, a period that included two successful light-heavyweight title defenses. 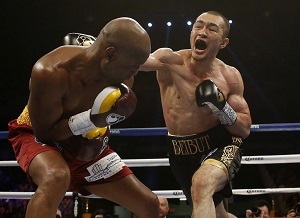 UPDATE: Shumenov improved to 15-2 (10 KOs) when Thomas’ corner stopped the fight after the fifth round. The fight was not aired as part of Showtime’s Khan-Alexander undercard.